Today is the first day of spring. You wouldn't know it to look out my back window, but it's true. I'm keeping fingers crossed for some spring like weather. Until then, I'm enjoying this light salad that is perfect for any time of year. Assemble the salad ingredients. Iceberg lettuce can be substituted for romaine hearts. In a small blender, process the one cup water and half a cup of almonds until very smooth. Squeeze through a nut milk bag and save the pulp for a future recipe. To the almond cream, add the rest of the dressing ingredients and blend again until smooth. 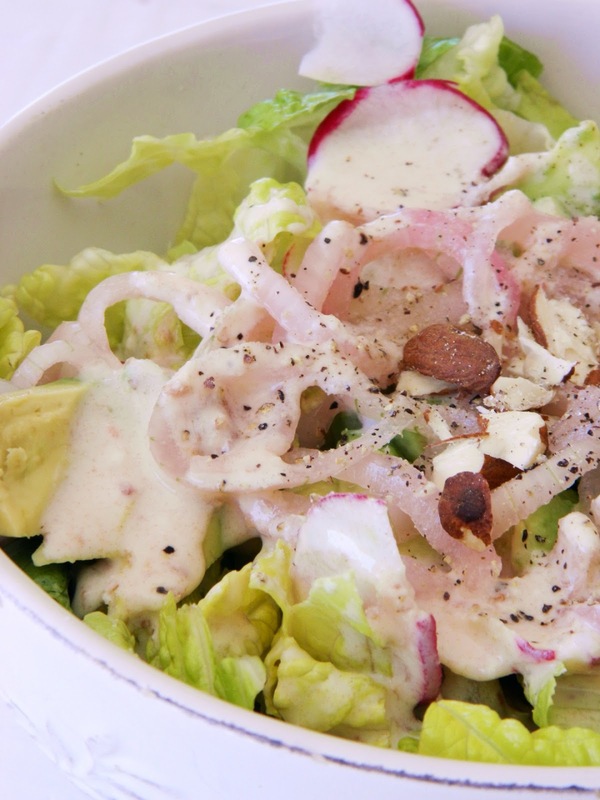 Dress the salad and add some chopped almonds. Extra dressing can be stored in the refrigerator for up to three days. This is what spring looks like around these parts (or at least in my own backyard)! What's it like in your neck of the woods? What a yummy dressing! Thank you! There is much more snow here... sadly! Thanks! And wishing for some warm weather to be sent your way!! Same here, Diane, with no warmth in sight. Feels like the never ending winter ... !